One can fall in love, over and over again, especially when visiting the Great Northern Peninsula, Newfoundland and Labrador. As you pass ancient fjords of Western Brook, the flat tablelands that feel like you’re walking on Mars, the natural wildlife and the beauty of the ocean, I must recommend you stop with your love and visit The Arches Provincial Park along the Viking Trail (Route 430). Ancient limestone carved by the rising tides, have masterfully created the Arches, a natural rock formation worth exploring. The site, contains picnic tables, parking area, washroom and includes a beachside trail leading to the huge rocks. A great place to picnic, take panoramic snapshots and be dazzled by pure natural beauty. I always enjoy walking under the Arches to experience the roar of the sea. This past trip, was my first on top of them, as the wind blew through my hair, the strength of the ocean could be felt at every turn. There is something immensely special about this place. Maybe you too will share in the magic, find that perfect heart and experience that perfect moment. It’s all about love – the Arches Provincial Park. 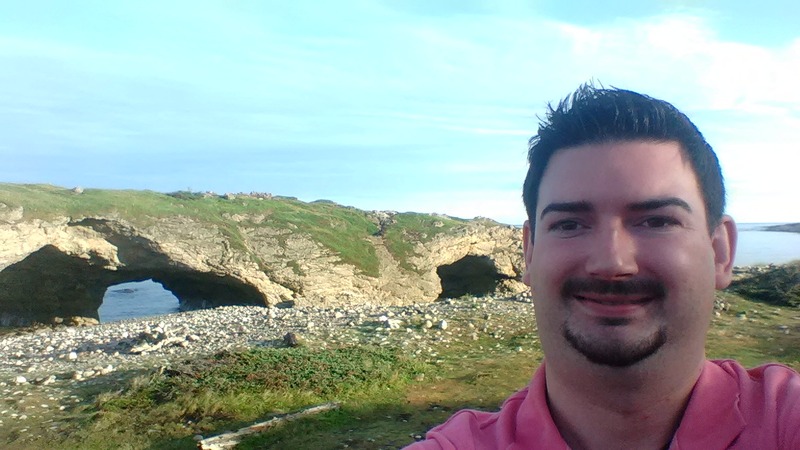 Christopher Mitchelmore, MHA for St. Barbe-L’Anse aux Meadows and Minister of Tourism for Newfoundland and Labrador. After two days of being in the concrete jungle of a major Canadian city, it was very refreshing to spend a week on holiday in our beautiful province of Newfoundland and Labrador. There is something magical about visiting the Tablelands, a World UNESCO Heritage Site in Gros Morne National Park. Each step you take, you feel as if you are on another planet. On the opposite roadside there is normal vegetation, but where the Earth’s mantle was pushed upwards and exposed, the pinkish brownish rock and masses are quite barren. This highly educational experience is also a photographers dream. Well, you know, it was a half billion years in the making! I highly recommend the daily guided tour at 10 AM by Parks Canada staff. However, if you happen to miss it, there is an App where you get an interactive tour along the way from a Parks Canada staff member. With my Discovery Pass good until June 2018, when visiting the Discovery Centre, I was given a tablet with the App pre-loaded that worked by GPS coordinates and proved very helpful on my trek. Without the App, I would have missed intricate details about boulders being out of place, where the water comes from and many other features of glacial formation along the way. It was nice to see the provincial flower, the Pitcher Plant on display along the trail. This is a carnivorous plant that is found at the end of every single tourism commercial we run. Along the two hour return hike, I encountered a range of visitors from the enfant to senior, from California to Ontario to Germany. There must have been 100 people on site, as there was no room for parking in the lot. Its fascinating to see all those with an interest to walk someplace so geological unique where the Earth’s mantle lies naked. It is most likely the best place in the World to see such a wonder and a great place to begin your adventure in Gros Morne National Park. A few kilometres down the road is a quaint fishing village of Trout River. It boasts a beautiful beach and walking trail and a few years ago have a whale beached along this very coastline. There is a nice restaurant, accommodations and some small shops. There’s a photo to be taken around every corner. Given my stay in Gros Morne would be very short, I decided to reach Woody Point for a later than normal lunch at the Loft Restaurant, which was full of buzz. I was quite fortunate to get an outdoor table overlooking the beautiful Bonne Bay. While eating the EmmCat Boat Tour came by for a cruise and we waved to those aboard. I had the fish and a salad with a glass of house white wine, that was generously poured. The fish was perfectly prepared, very moist and flaking apart as you placed your fork into it. This restaurant comes highly recommended and is open until September 30th. Walking around the waterfront, the downtown of Woody Point, seeing the historic buildings it something that just makes this place a must visit location. The Merchant Warehouse is a lovely place for pub grub and usually evening entertainment. There is a classic diner on site and the Legion is next door. Studios, craft shops, coffee shops and general business seem to keep growing. Including Gros Morne Summer Music, Woody Point Writer’s Festival and the performances that take place as Woody Point Theatre. This Town has a lot going on day or night and likely was a reason there was no accommodations available. Be sure to book early if you wish to stay here and many places on the island of Newfoundland and Labrador. Tourism is growing in numbers! I love Norris Point, it is home to the Trails, Tales and Tunes Festival, which kicks off the season in early May. I was fortunate to get two nights at Neddie’s Harbour Inn. The view is just spectacular and it truly is the perfect getaway. The first two images below is that of Jenniex House, a heritage home and the view of Norris Point as you enter. It truly is breathtaking. I love the vibe here, including the Voice of Bonne Bay (VOBB) Community Radio. There are pubs, restaurants, coffee shops, boat tours, adventures, craft shops, Bonne Bay Marine Station and so much more. The final 4 images are the view from Neddie’s Harbour Inn and some great eats at the Black Spruce Restaurant at the same location. It has a view of the Tablelands and the Appalachian Mountains of either site. The view, atmosphere and food is all of the highest quality. It’s no wonder they were a focus of Air Canada’s En Route Magazine. I pack a lot in a one-day adventure in Gros Morne. If you have more time, you may want to space out your activities over several days. There are many great walking and hiking trails and places to visit that make for a unique experience. The Bonne Bay Marine Station, a research arm of Memorial University is nestled in the quiet community of Norris Point aims to expand knowledge of marine ecology. I have been to the centre on a number of occasions, including an International Fisheries Symposium hosted by Community University Research and Recovery Alliance (CURRA). It is a great place for people of all ages to have fun and learn about ocean life! I took the visit from a water taxi departing Woody Point and returning later in the evening. A 20 minute water taxi saved an hour of driving and provided a great view of dolphins! Totally worth $14 return. One can get a guided tour, explaining sea anemones, lobsters, crabs, starfish, wolf fish, sand dollars, sea urchins and a variety of other creatures. One can truly experience the squishy-ness of the starfish and take up scallops and other items in the touch tank. I was thoroughly impressed by our guide, as she expressed enthusiasm and also great knowledge as she opened shell of the female crab or engaged a colleague digging for worms. We spent some time in the upper level as well where there are digital learning areas, interpretative panels and displays. Additionally, there is a library, classrooms and laboratories that are part of the educational program. The Encyclopedia of Local Knowledge the brainchild of Pam Hall, adorns the walls. It highlights local knowledge from the Great Northern Peninsula, many of it focused on the fishery and living rural. After a visit to Bonne Bay Marine Station, one can take a Bon Tour on the Emm-Cat of the bay or drop by for a pint and some wonderful seafood chowder at the Cat Stop Pub. Norris Point is home to the iconic “Trails, Tails and Tunes” festival, Voice of Bonne Bay Community Radio Station, Gros Morne Adventures and a number of local businesses that cater to tourists taking in beautiful Gros Morne National Park. There is much opportunity to promote and partner fisheries-tourism synergies and to also partner education with commerce as a means to enhance community and economic development. 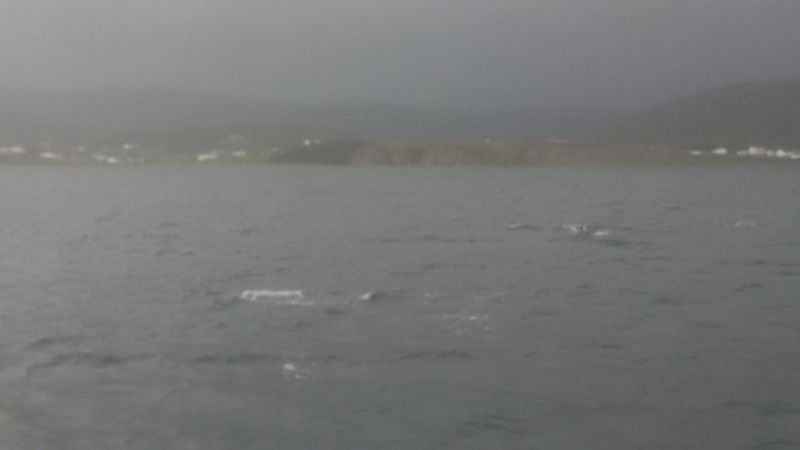 Ocean comes to life at Bonne Bay Marine Station. Drop by and let me know what you think. A few weeks ago, I took a vacation and spent a couple of days in the Town of Woody Point. I was greatly impressed by their overall product offering that promotes one another’s small business and supports overall growth in the region. I took Route 431 at Wiltondale and checked in at the office at Aunt Jane’s Place, which their gift shop resembled a general store. The old-fashion cash register was a nice touch. I collected the keys to Uncle Steve’s Place, which was a traditional salt box home built in the late 1800’s. This was referred by Darlene Thomas of Seaside Suites, as they were booked for the weekend. Thank you! Woody Point is famous for its annual Writer’s at Woody Point Festival in August, which draws some of the province’s biggest literary names. It continues to be a thriving success! Nightly entertainment is extremely important to any tourist visiting an area and will extend the stay. I likely would have only booked just one night and moved on, however, there was nightly entertainment offered at the Merchant Warehouse throughout the weekend. After hearing Jeff Quilty was playing, I knew it would be worth a second night as I love his traditional Irish and Celtic styling. Just outside Uncle Steve’s Place was “Molly Made”. I’ve seen her rug hooking kits for sale at places like Grenfell Historic Properties, St. Anthony and other venues. However, it was a real treat to drop by her shop and see the studio where all the magic happens. It was also nice to see how this business supported others selling “Aunt Maggie’s Homespun” products. I bought I lovely set of mittens and a rug-hooked mummer for my Christmas tree. The area is easy to navigate for the novice tourist, as there are directional signs helping you find the business and places you wanted to experience. There are printed maps outlining what is available in the region and the Town itself is highly walk-able. This is an attractive feature! 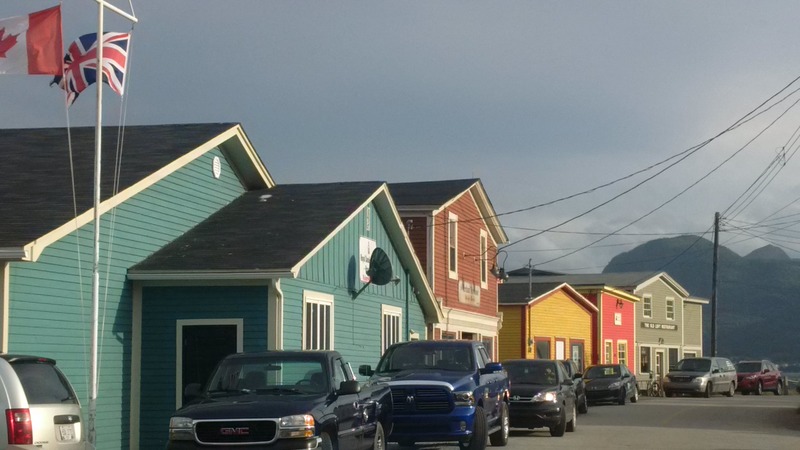 I truly enjoyed all the vernacular architecture, the food and entertainment at the Merchant Warehouse, dart night at the Legion, seeing Coldwater Cowboy Todd Young, his vessel, taking the water taxi to Norris Point and enjoying the natural beauty of the area. In addition we visited neighbouring Trout River, the Tablelands World UNESCO site and the Bonne Bay Marine Station in Norris Point. There is so much to see and do, even in just a couple of days you can fit lots in. I would have loved to have watched a show at the Theatre, however, I had to make the short trek to Deer Lake to pick up my friends. We ended up dining at The Loft restaurant which has a unique atmosphere. I highly recommend the halibut, it was cooked to perfection. I really enjoyed the co-operation between the business community to support one another and encourage you to experience all the Town and what neighbouring communities had to offer. It provides a very good selling point for the Town and the region. They truly benefit from collaboration and will see further growth and new business opportunities created through these partnerships. A wonderful couple of days, with incredible customer service! I look forward to future visits. Woody Point is a great starting point as you make your trek up the Great Northern Peninsula. Have you been to The Arches? The Arches Provincial Park is a natural wonder created by tidal action just north of Gros Morne National Park near the community of Parson’s Pond on the Viking Trail (Route 430). If you have never been, I would encourage you to pull over and take a few minutes to see it in person. The massive formation is within view of picnic sites, which is great if you wanted to have a lunch and enjoy the beauty of your surroundings. Day users also have access to pit toilets. There is a paved parking lot, boardwalk and expanse of natural walking areas. On a recent visit with friends from Alberta, we stopped for awhile. There were others sitting on driftwood, some had climbed to the top and others were getting their feet wet as the tide rolled in. Certainly a special feeling when you just take the time to enjoy something Mother Nature so freely gave us. The Great Northern Peninsula is filled with many natural wonders, incredible scenery and the beauty of being surrounded by unique landscapes and being surrounded by water.